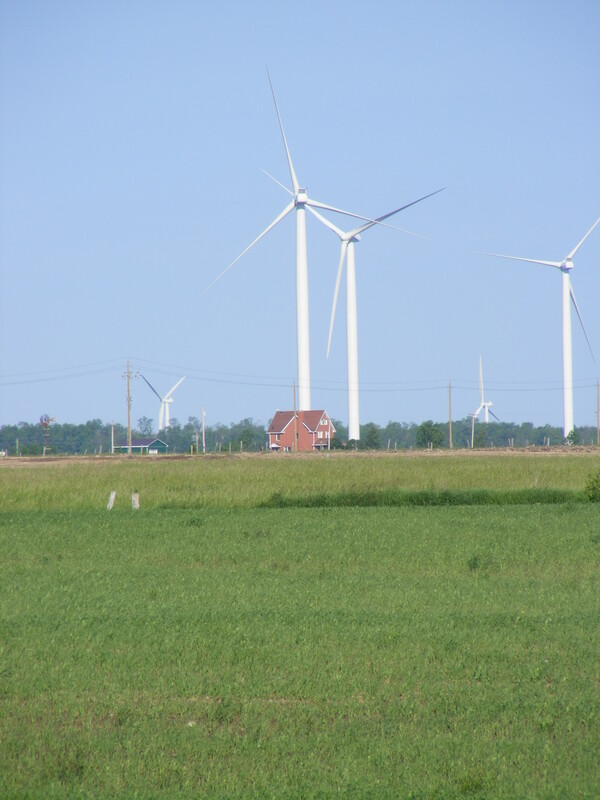 Wind farm under construction near Kincardine in Bruce County, Ontario will ruin the area. It will affect everything from tourism to property values. Say NO to wind farms. Posted in Suncor wind farm in ripley Ontario, truth about wind farms, wind farm Bruce County, wind farm noise Ontario, wind farm video, wind turbine noise, wind turbine setback, wind turbine video, wind turbines. Editor: Ever since I got involved in the STOP THE WINDMILLS fight, 2 years ago, I’ve continually said that it would be the folks in the eastern part of Ontario that would be the ones to show the way for the rest of the province. The people of the Ottawa Valley still know what’s important! To the councils in SW Ontario – it’s time you stood up for your constituents. The time has come to stop rolling over to the whims of the wind industry and the govt. Take a trip to Eastern Ontario, borrow some backbone and stand up for your constituents. You don’t do this to your friends and neighbors! No wind-powered energy projects will be approved in South Algonquin for the next 10 years, the township’s council has declared. The declaration, which was supported unanimously by councillors, came last Thursday night following a council meeting considering a proposal to construct a series of wind-power turbines in the hills along the Highway 60 corridor. RES (Renewable Energy Systems) Canada wants to build 40 to 60 of the massive wind-power turbines in the area east of Algonquin Park. The plans, particularly for the construction of several of the turbines around pristine McCauley Lake, are unpopular with many seasonal and year-round residents. Several opponents of the project were present at the meeting, and gave a short presentation. “We are united as a community, and we are asking for your protection,” he told council. The cottagers are asking that RES be required to locate its turbines, currently planned for the hills in full view of the quiet lake, out of sight and hearing distance from the lake. The PowerPoint presentation showed photographs of the lake’s vista, along with enhanced pictures showing what that vista would look like with wind turbines erected on the surrounding hills. “These things are massive and they will completely change the experience of living on the lake,” Peterson said. “Your constituents are extremely anxious and very upset.” Peterson added that the McCauley Lake residents “know this is a big decision and that there are a lot of dollars involved.” But he said many of the people are considering leaving the area, or putting off plans to retire to their cottages if the turbines are built. Harvey Leeman, a longtime Ontario Hydro employee and a McCauley Lake resident since 1949, and a hunter and fisherman as well as a forest manager, questioned both the assessed impact of the wind turbines on wildlife and the need for the electricity they will produce. The RES proposal wants to take over “the heart of the last block of public land” in the Algonquin Park area, Leeman said. He pointed out that, while the company says each turbine has a one-acre footprint, “they want 6,000 acres of Crown land” for the project. He pointed out that there are few local benefits from the turbines, either in jobs or in significant tax income and said RES estimates of job creation and local benefits come with heavy qualifications and are “greatly exaggerated.” The estimated $150,000 in tax income for South Algonquin would be lost in the decreased property values that the turbines would cause, he charged. After the presentation, Councillor Richard Shalla presented a motion, seconded by Councillor Joe Florent, that would impose a moratorium on wind turbine approvals. After some discussion, the motion was amended to set the 10-year period, and a provision was added for a township-wide referendum on wind turbines, if council deems it necessary. The motion was approved unanimously, and sparked loud and prolonged applause from the small group of people in the audience. “I’ve been at council a long time and I’ve never had people clap for me,” Mayor Percy Bresnahan said, sparking laughter throughout the room. Stephen Cookson, development manager for the RES Canada project, said he understands the reasoning behind the township’s move. He said RES remains committed to its plans. “I think South Algonquin is being very prudent in waiting until all the information is in concerning the project. We hope that council will take as good a sounding as is possible” on the proposal. Response to my letter to the editorial board of the Toronto Star. If you live in the country you count for nothing. Below is a video from the Suncor wind farm, Ripley Ontario. Since the video was made several families moved out of their homes because of the noise. Suncor has shut down some of the turbines so the people could move home. A councilor who voted for the wind farm in Ripley, and has at least one turbine on the property, has been forced to leave the farm after suffering headaches, nosebleeds and sleep disturbances caused by the wind turbines. The closest turbine to the home is 700 meters. Maybe that’s a form of poetic justice. The Ripley council was warned about the negative affects that would occur if the turbines were within 1km of homes. Evidence suggests a setback of 1mile or 1.5km is required as a buffer between a home and a turbine. Most setbacks in Ontario range from 300 – 450 meters. How many families have to suffer, before the govt. wakes up to the reality that wind turbines are being placed too close to homes. Or do they even care? This also happened at the Port Burwell Wind farm, severe headaches and nosebleeds. The result, the family was bought out by the developer. Wherever wind farms have been erected in Ontario, both people and animals are suffering from both noise and stray voltage. I got a call from a farmer the other day, who says the feet on his bull are burnt because of stray voltage, he also lost many calves last spring. The MOE in Ontario continues to allow new wind farms while refusing to call for a health study or require realistic setbacks. Posted in kincardine wind farm, Liberal energy policy, Ministry of Environment, Municipality of kincardine, Ontario Hydro, Ontario wind farms, Politics, Premier Dalton McGuinty, renewable energy, Suncor wind farm in ripley Ontario, truth about wind farms, wind farm Bruce County, wind farm facts, wind farm Kincardine, wind farm noise Ontario, wind farm video, wind farm wind energy kincardine bruce county, wind farms Kincardine township, wind turbine noise, wind turbine setback, wind turbine video, wind turbines, Wind turbines and health, Wolfe Island.